Posted on 10/07/2016 Is There Iowa Workers' Compensation for Volunteers? 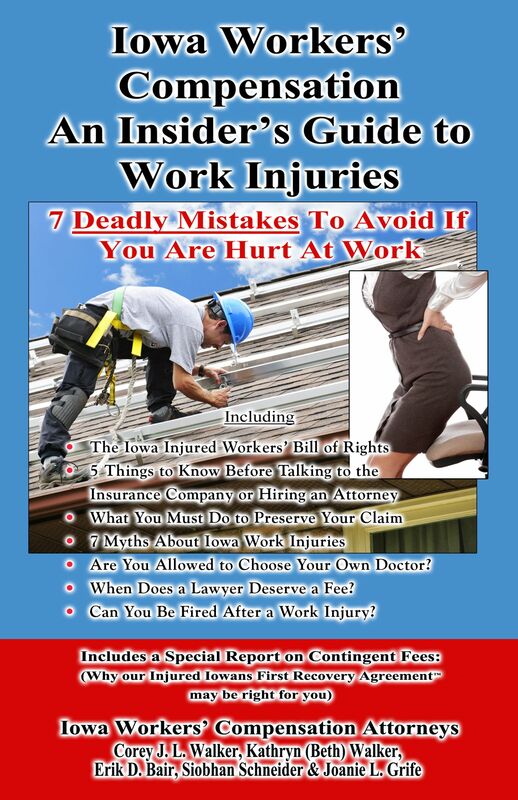 ?What are the time limitations to file an Iowa Workers' Compensation claim? ?I am a truck driver who lives in another state, but was hired by an Iowa trucking company. Where should I file my workers’ compensation claim? The consequences of a broken neck can be severe. Although these neck injuries many times happen in sports, they also may result from being hurt at work in Iowa. It may stem from a crash (such as with a company car), a fall from an elevated surface or any other accident in which excessive force causes trauma to the neck. The neck is made up of seven cervical vertebrae, which, like other bones, can be dislocated or fractured. The reason this type of injury can be catastrophic is because running through the vertebrae is the spinal cord. Although a broken neck doesn’t always cause damage to the spinal cord, when it does, there is the potential for paralysis or even death. Paralysis can be temporary or permanent. But what makes a spinal cord injury in the neck especially devastating is that it affects the person from the neck down. Of course, those injured could suffer other neurological problems, depending on the severity of spinal cord damage. Recognizing signs of a broken neck is critical. If possible, the individual shouldn’t be moved; movement could cause further injury. When there is any suspicion the person has a broken neck, it’s important to seek emergency medical attention. Sometimes the person will experience an immediate loss of mobility if there is a form of paralysis. In some cases, the individual will go into shock. Signs of this may include weak pulse, shallow breathing, clammy skin, pupil dilation and loss of consciousness. If the individual is conscious, he/she may complain of severe neck pain. If a nerve is compressed, the pain will spread to other parts of the body, such as the shoulders and arms. Visible signs of a neck fracture could include swelling and bruising at the site of the injury. A mild fracture typically doesn’t require an invasive form of treatment. The person may be given medication to treat the pain and wear a brace that immobilizes the neck for about two months. Sometimes the individual is fitted with a neck cast that’s worn for a couple of months or longer. In a more severe injury, the person may require traction. Some allow for limited mobility, while other devices prevent any type of movement. Depending on the injury, this therapy can be done at home or may require hospitalization. Meanwhile, some may require rods, pins, screws and other internal materials to support broken bones. These may be surgically implanted following the accident. Some might require spinal fusion, where bones (or similar synthetic material) are fused in the space between the vertebrae. They are held together with metal rods, screws or plates. Keep in mind that just one of these treatments or a combination of neck treatments and surgeries may be used. Often, the individual will have to undergo physical therapy. And of course, the injury likely would result in missed time from work. But if it was a work injury, there could be compensation available through workers’ comp benefits. Workers’ comp is available to those hurt at work in Iowa to pay for medical bills and replace a portion of lost income. It also may provide assistance if vocational training is required after the injury. Workers in Des Moines or nearby areas can call to set up an appointment with a lawyer at Walker, Billingsley & Bair to discuss eligibility for workers’ comp benefits: (888) 435-9886.